Most companies use automated machines to engrave lighters, even for custom jobs. However, engraving is an ancient art and you do not need highly technical machinery to do it. All you need to customize your Zippo are a few easy-to-find engraving tools. And if time is short and you don’t mind the mechanical appearance of the resulting design, you can even use an electric dremel tool. Whichever path you choose to take, you can easily engrave your lighter at little cost. Empty your Zippo of any fuel. Place your design over the carbon paper, with the carbon side facing down. Place both of them on top of the Zippo and tape them in place. Trace over the design using a pencil. Be sure to apply significant pressure to insure that the carbon paper creates a well defined copy of your design. Remove the tape, design, and carbon paper. Your design should appear on the lighter. Don a dust mask to avoid inhaling metal particles. Test your engraving tools out on a piece of scrap metal to determine which tools you with to use. If you use hand engraving tools, experiment with the different stamps and chisels. If you use a dremel, experiment with using different heads. Place your lighter in a vice attached to a table. Make sure it is held firmly. 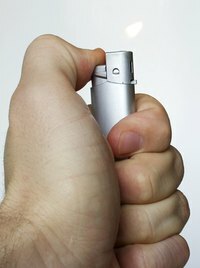 This will free up your hands and allow you to work on the lighter without moving it. The best kind of vice to use is one that you can rotate in place so that you can easily access the lighter from different angles. Begin to engrave your Zippo by going over the design using engraving tools or a dremel. If you use engraving tools you will probably opt for push gravers, which are small chisels that bite into the metal when you apply pressure from your thumb. Larger gravers may require a soft wooden or rubber mallet, but you will be unlikely to use these on such a small piece. If you do, be sure to use a soft mallet and not a metal one, as a metal one will damage the graver. Apply stamp gravers to your image to act as shading or design elements. To do this, place the stamp to the surface of the Zippo and tap the back of it with a soft mallet. Brush any excess metal particles away from the surface of the lighter and dispose of them in the trash.